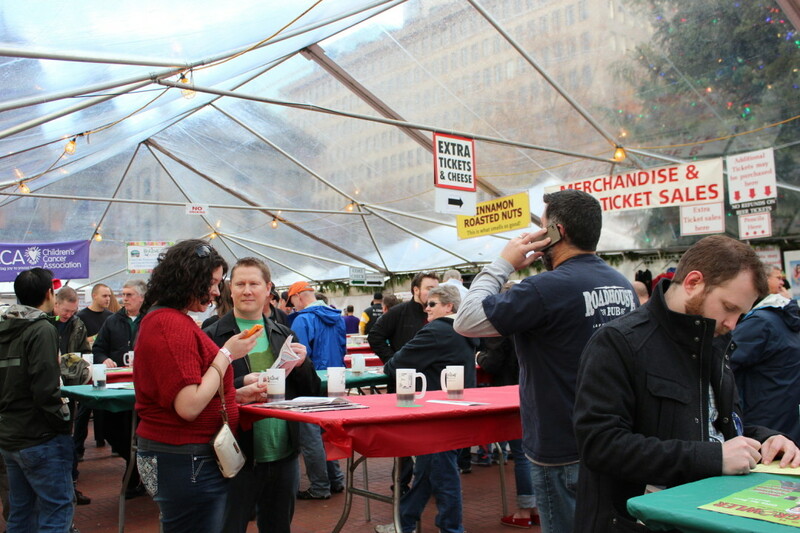 The 2012 Holiday Ale Fest drew an enthusiastic and thirsty crowd of some 17,000 folks over the course of its five-day run, as beer geeks gamely traded tasting notes and tirades about the more than 50 brawny winter beers on display. With keg-bearing brewers from Oregon, Washington, Colorado, Montana, and California hawking their wares, it was a relatively easy matter to find something to suit every flavor profile. The most delightful beer I had the pleasure of tasting was Widmer Brothers' Brrrbon Vanilla-Cask Strength. A mélange of vanilla and chocolate accents, this barrel-aged imperial red IPA is just about the perfect beer to get cozy with after a cold, rainy winter’s day. And with a 10.5 percent ABV you’ll definitely be feeling a good deal jollier in no time. Tied for second was California brewery Firestone Walker’s Rufus (quoted by a fellow festival attendee as “the best beer [he’s] ever tasted”) and Rusty Truck Brewing’s Cherry Chocoholic Baltic Porter. This seasonal from Lincoln City was the favorite of just about everyone I talked to—and was well worth the four tickets to get a full mug's worth. Rufus is a heavy hitting strong ale with a potent mix of bourbon and intense caramel tones; you know you’ve got a successful beer when it tastes like Christmas spirit in a glass. The Cherry Chocoholic Baltic Porter is a chocolaty smooth sip that starts heavy on the cherry and ends nicely on the malty side. Though cherry beers seemed to be trending at this year’s fest, Rusty Truck did the best job. Rounding out the list of most interesting brews was the Frambozen that came from Colorado’s New Belgium Brewing. For anyone still grieving the discontinuation of Ben & Jerry’s Magic Brownies ice cream, the Frambozen is a welcome substitute. The Belgian-style brown ale is a finely orchestrated melody of chocolate and raspberries with a slightly tangy finish. I admit I had fantasies of freezing it and making my own Magic Brownies ice cream. Another time, perhaps. For all the good though, there was also some bad. 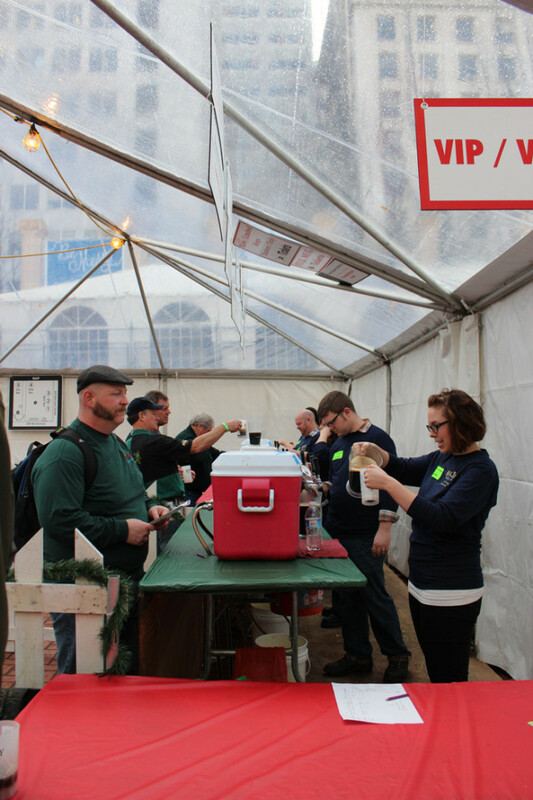 The Holiday Ale Festival is traditionally an occasion for brewers to pull out all the stops and get experimental with their ingredients. And as we all know, sometimes experiments fail. Topping the list for me was a stout called Milk and Cookies from Lucky Labrador. While unique in theory, in practice it tasted like the beer was lactating. All I could think about while drinking it was that part in John Steinbeck’s Cannery Row where Doc orders a beer milkshake at a diner. There wasn’t much of a cookie flavor, but a whole heck of a lot of milk, and that was certainly enough to stop after a second mouthful. MacTarnahan Brewing’s Figgy Pudding fruit ale was another unfortunate selection. I have never had figgy pudding in my life, but if the taste is similar to this then I believe I’ll pass. As one of my fellow attendees delicately put it, “It’s a yeast infection in a bottle.” Barrel-aged to disaster and tasting more meaty than fruity, this fig puree blend ended up in a nearby trashcan. Sorry, beer gods. 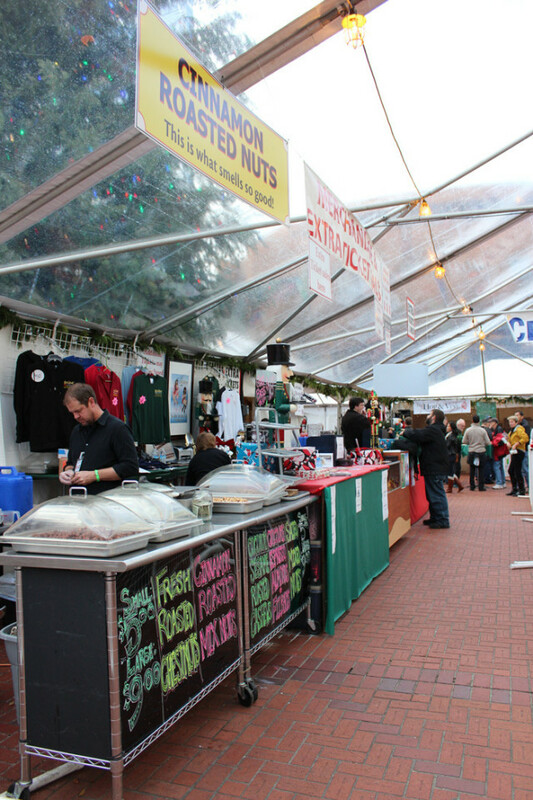 Despite the flavor peaks and valleys, I feel most attendees will agree with me that this is one of those singular events that makes Portland such a desirable address. The fact that loads of people fly in just to attend seems a pretty decent indication to this reporter. Till next year!